Ever since its foundation in 1737 Van Lanschot Kempen has been committed to doing business with respect for the world around us and with an eye for future generations. We believe that wealth is more than money. Mark Manders wins the Van Lanschot Kempen Art Prize 2018. Our collection captures the sheer versatility and richness of Dutch visual art. A unique collaboration bringing together two organisations with a long Dutch history. 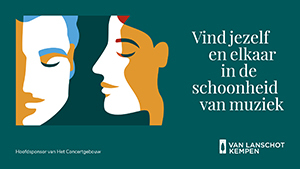 Van Lanschot Kempen is the main sponsor of The Royal Concertgebouw. The Concertgebouw is considered one of the most important concert halls in the world because of its unparalleled acoustics and wide range of high-level programming. It's mission, to connect and enrich people with an unparalleled musical experience, is a perfect fit with Van Lanschot Kempen’s profile in the cultural arena. For any sponsorship requests, please consult our sponsorship leaflet (in Dutch) to find out what we require from a sponsorship. If your request meets our requirements, you can submit a sponsorship application by emailing us at sponsorship@vanlanschot.com.